Yo! I have a Patreon Page! Check it out if you like my stuff and want to support me making more! I had a blind substitute teacher way back in 1st grade. She was awesome, she had a cool black lab as her guide dog, and I was amazed at how someone can read with their fingers. Braille is super cool. I’ve been seeing ads for braille tablets and phones now too. Devices with haptic response, a braille pad, a camera that can read things out for its user. Really, really cool stuff. We don’t get too many sight impaired people in the bookstore,which is sad. It means we don’t really carry any braille editions of books here. The one exception that I can recall is with Harry Potter and the Deathly Hallows. We had 2 braille copies come in. It was cool to handle it, move my fingers across the pages and feel the words but not read them. 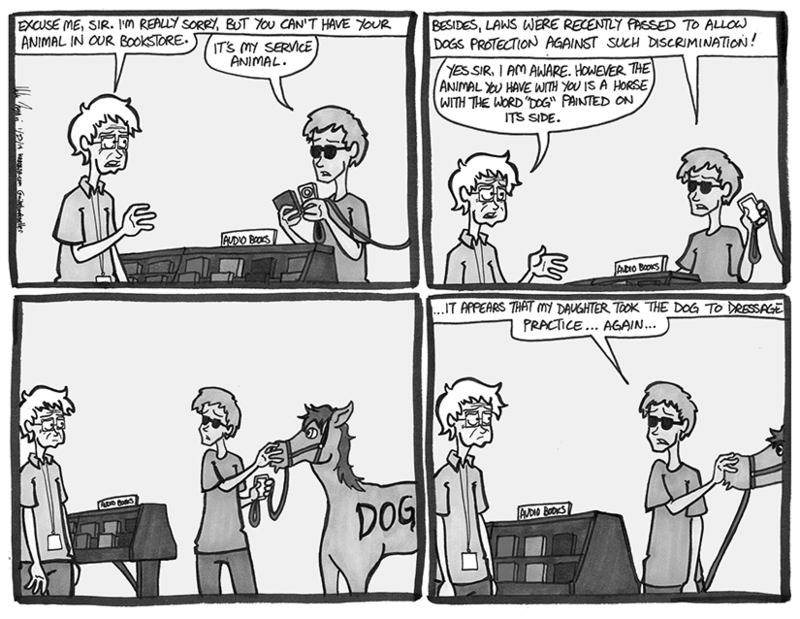 Crazy enough, when I was hashing out this strip with my brother, we found out that miniature horses are also used as service animals!